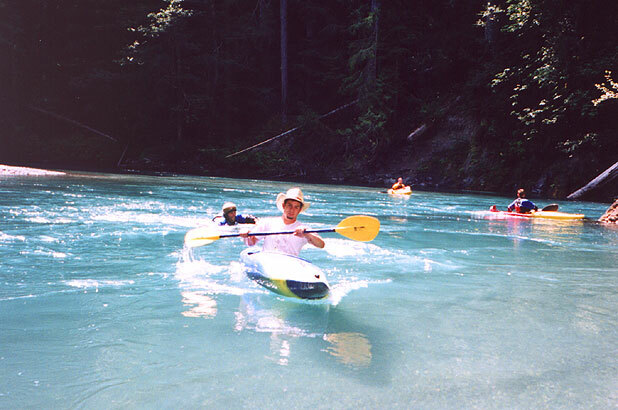 In August of 2002 we headed back up to the Olympic Peninsula for another trip down the Grand Canyon of the Elwha. Jon Loehrke flew in from Idaho for the trip, joining up with John Whaley to head up on Thursday the 8th. Josh Knapp and I headed out of Portland on Friday evening, battling traffic up I5 but making good time once clear of the city. We arrived in Port Angeles on the Northern tip of the Olympic Peninsula at 9:45 p.m. after almost five hours of driving, and camped just within the limits of Olympic National Park. On Saturday morning Josh and I drove up to the trailhead for the trail which parallels the Elwha up into the mountains. Whaley and Loehrke were already up in the mountains somewhere, so we got ready for the eight mile hike up to the put-in. Soon enough we were on the trail, setting a brisk pace. We started hiking around 7 am, and made pretty good time. We soon reached the settler's cabin a couple of miles in, which has several trails leading down to the river. I remembered that one of these trails led to the the bridge which was where we needed to stash our camping gear below the Grand and above Rica Canyon, but I took the wrong fork in the trail and ended up wasting about a half hour looking vainly the bridge. (It had been a couple of years since I had last done the grand, and I was a little foggy on where the bridge was). Finally I gave up and jogged back up out of the mini river valley up to the cabin where Josh was waiting. We shouldered our boats again and headed up the trail, still carrying our camping gear. Luckily, we were overtaken by a couple of hikers about twenty minutes later, who said that the bridge was at Dodger's Point (I had seen the sign for Dodger's Point, but hadn't realized that was where the bridge was) so we stashed our camping gear behind a log and continued up the trail. The rest of the hike was pretty uneventful except for the bear that crashed around in the bushes for awhile just before we reached the fork in the trail leading down to the Lillian River. Once at the Lillian River campground we rested for about 15 minutes at the bridge over the Lillian, and then got ready for the crux of the hike. At this point we had carried our boats about 5 miles, which made the switchbacks over the ridge above the Lillian even more challenging. We stopped a couple of times to rest before reaching the top, and then began the long last couple of miles downhill to the put-in on the Grand. Five miles into the hike, Josh leaves Lillian Campground and prepares to tackle the switchbacks up over Lillian Ridge. Around noon the trail dipped down to the river and we scrambled out of the bushes onto the gravelbar marking the put in. I blew my whistle a couple of times, and soon heard Whaley and Loehrke shout back out of the trees on the gravel bar. They had hiked in the day before, and had been lazing about in the sun, waiting for us to arrive! We all got ready, and after a twenty minute break to drink water and eat some food we got on the river. The level was considerably lower than the last time I did the Grand, about 800 cfs on the gauge (vs. 1175 cfs the last time) so the warm up rapids seemed much less pushy than before. 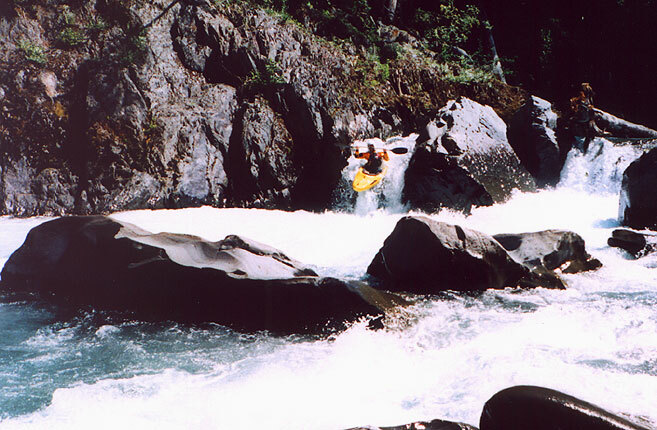 Since Jon and Josh had never done the run before, they were both marveling at the scenery and water quality, along with the clean nature of the rapids. "Just wait." I told Josh. "You haven't seen anything yet.."
Soon the river bent to the right and we entered the Grand Canyon proper. The walls soared impressively overhead, and we became very focused. The first rapid was a blind class IV drop with some logs wedged in it, which we boofed over on the left, and then we arrived at Eskimo Pie. This drop is very difficult to scout or set safety for, but I managed to pull off my patented bellyflop move onto the right wall in order to do so. Gary Korb calls this "SCARY" in the guidebook as it is done right at the lip of the drop, and I would have to agree with that..
Josh runs the entrance drop at Eskimo Pie, a funky diagonal boof move past a munchy hole that is a LOT meaner than it looks in this picture. If you look carefully behind him, you can see the striated black-and-white walls that give this rapid its name. Josh runs the bottom part of Eskimo Pie while John Whaley watches from below. The next rapid was a large, steep boulder garden that was pretty trashy at this flow, so we did a sketchy portage on the right wall. As we portaged we could see (and hear!) Nightmare just downstream, and the excitement levels went up a bit as we all contemplated the first unportageable, unscoutable rapid on the Grand. Whaley was first across the portage, and when the rest of us seal launched into the emerald pool above Nightmare, he was nowhere to be seen! "Where'd he go?" I wondered aloud as we hovered in the pool above Nightmare. Ahead the river divided around a huge boulder in the middle of the river, and the roar of the rapid reverberated off of the walls soaring overhead. "Shoot, I think he already ran it.."
Sure enough, Whaley was gone! I grinned at Josh and Jon. "Alright, see that left side slot? Just run that side, then stay left the whole way down..." I went first, boofed the top pourover, hit the left wall, got a huge, unpleasantly surprising stern ender out of the hole, and just managed to straighten out before I hit the next drop. I came rocketing around the corner, and saw two things: A couple of large logs wedged between the walls at the bottom of the drop, and no sign of John. I charged right and ducked under the logs (there was plenty of room) and then I heard John yelling overhead.. He had climbed the cliff on river left and was cheering us on! Downstream there were more nice rapids, and the canyon scenery was awe-inspiring..
Josh, (the probe as usual) runs a drop downstream of Nightmare. After running this drop downstream, Josh sets up to take photos. Soon we reached Landslide, the last large rapid in the Grand Canyon. We all ran the first half of the drop, catching a small eddy above the final triple drop. We decided to portage this final drop because there was a log pinned vertically in it. 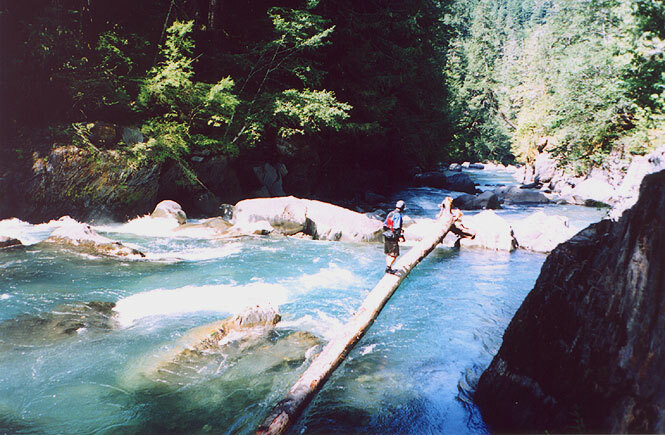 The drop was runnable, but the wood was a little unnerving and had the remnants of a rootwad facing upstream. 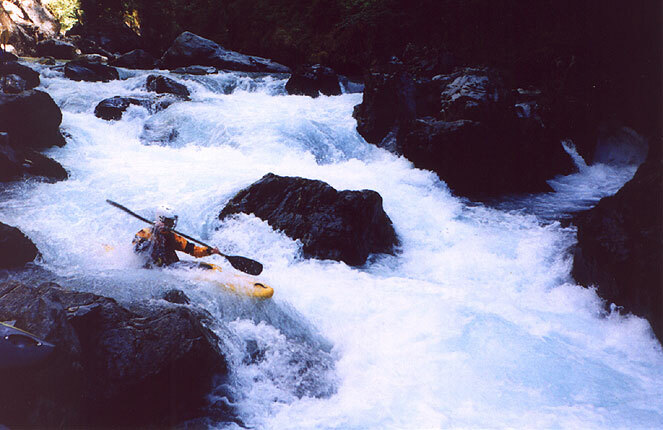 John Whaley gives scale to Avalanche, the final rapid in the Grand. 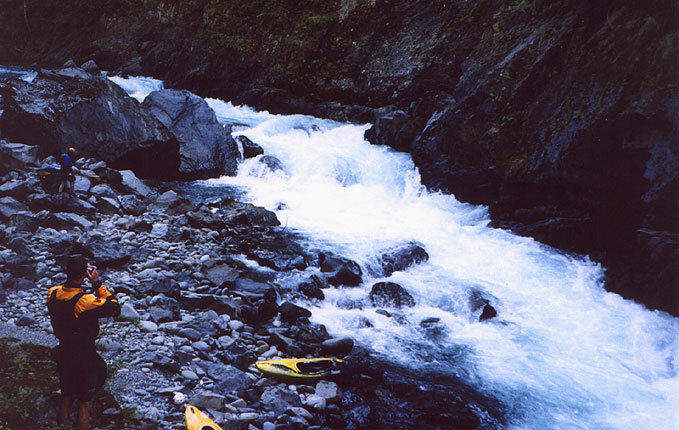 We portaged the last triple drop in this rapid; if you look carefully you can see the large log vertically pinned on the river-left side of the channel, with the remnants of a rootwad on at the top of the middle of the three drops. Just below Avalanche we took out to camp at the Bridge at Dodger's point. 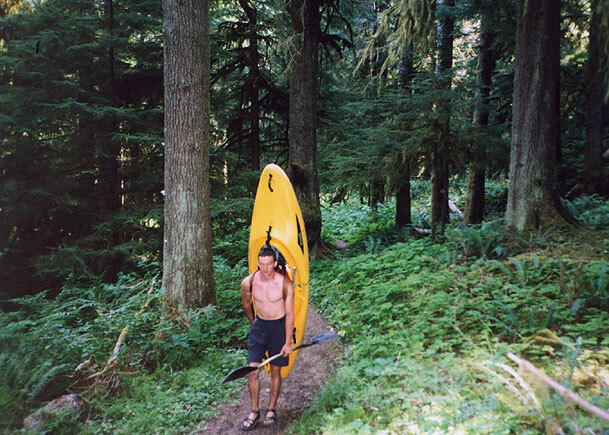 Josh and I had to do a three mile round-trip hike to get our camping gear, so we were pretty tired after hiking for almost twelve miles and then paddling four, so we crashed out almost immediately while Whaley and Loehrke hiked up to scout a side creek. In the morning we dragged ourselves out of our sleeping bags and got ready to go. It was another beautiful August day, and we were about to run Rica Canyon! 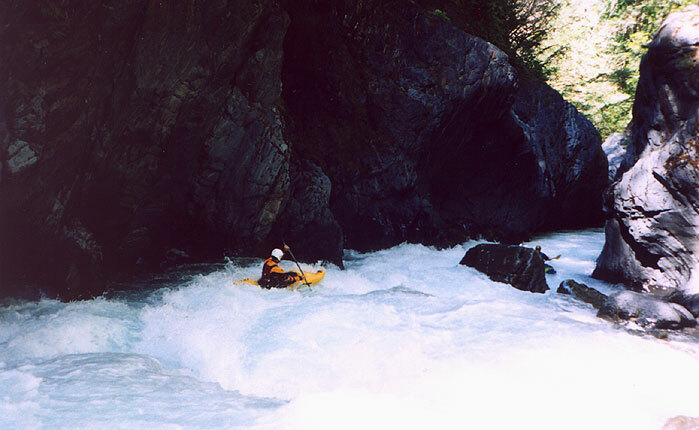 Rica is the second, shorter canyon on the Elwha, slightly easier than the Grand but with some pretty impressive rapids. After a couple of miles of annoying class II (and one log portage) we arrived at the entrance to Rica. 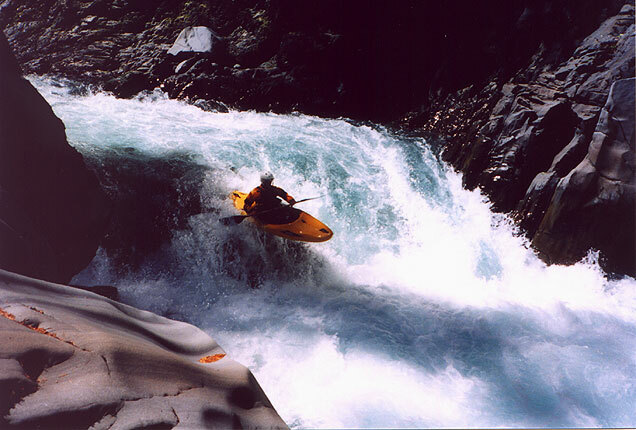 The first drop in Rica is known as Goblin's Gate, and it is another typical Upper Elwha rapid: Big, hard to scout, and impossible to portage. Of course, we had no intentions of portaging this drop, but a rope hanging from the wall overhead spoke mutely of at least one escape attempt. The first part of Goblin's Gate is a narrow, foamy chute along the right wall that carries you through a soft hole at the bottom. A quick scramble into a tiny eddy against the right wall (don't flip!) allows you to scout (but not portage!) the main drop, a super sweet diagonal ledge with a nasty pin spot on the far right and a cool boof flake in the middle. The last time we ran Rica (with a lot more water!) I got a huge stern ender out of this hole, but this time the boof was IN! Josh nails the boof on the bottom drop at Goblin's Gate. 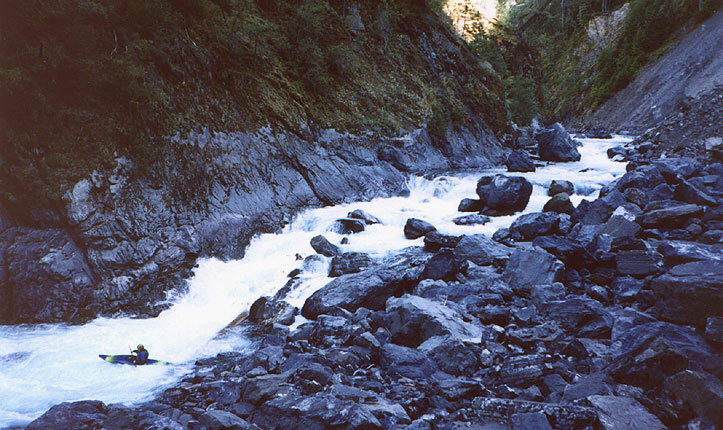 Jon Loehrke had the most exciting line on the bottom ledge, going with the flow on the left through the huge hole, disappearing completely only to reappear ten feet downstream with a surprised look on his face..
Downstream were several more sweet boulder gardens. The first one required a balancing act on a log to scout, and ended up being clean on the far right.. Soon the rapids mellowed out and we approached Lake Mills. 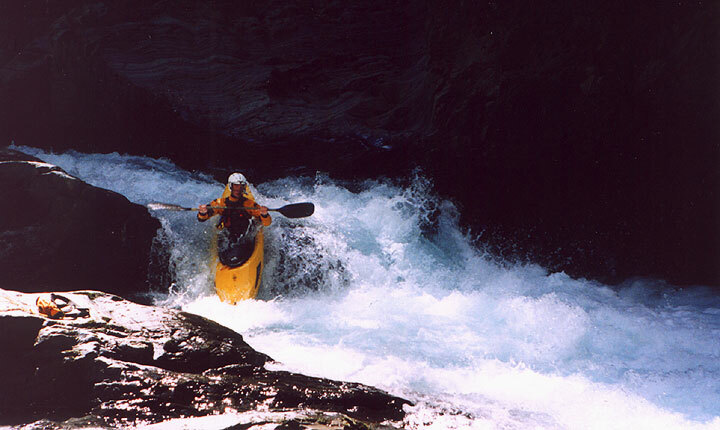 Everybody was buzzing from the last couple of days of paddling, and generally feeling good. A half mile above the lake we encountered a couple of fishermen who were trying to get across the river, so we loaned them our boats, gave them a quick lesson in kayaking, and let them paddle across..
John swims and shouts encouragement as the second fisherman tries not to flip going across the river. Soon we reached the lake and Josh and John hiked out to get the vehicles while Jon Loehrke and I towed their boats (loaded with their gear) across the lake. It was a great workout, towing a couple of creekboats three miles across a reservoir with a strong headwind (the wind was so strong it formed whitecaps!) but we managed to hug the shore for most of the way to avoid the worst of it. Soon we reached the dam, and the vehicles, and promptly ate everything we could get our hands on (Josh and I had eaten the last of our food that morning at the campsite).